People biking and walking on the Dequindre Cut in Detroit. 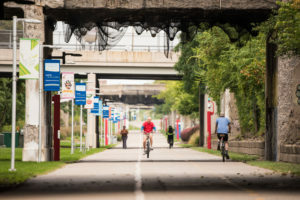 The 40 miles between Detroit and Ann Arbor — connected by highways, neighborhood streets, railways, and bike-trails — enable mutual exchange of knowledge and culture across the our region. These 40 miles can be traversed in many ways, and here you’ll find information on a range of transportation options to fit your needs, as well information about how to get around within the City of Detroit.